Can you really build a DIY solar system from scratch? Nothing is impossible, if you are willing to do the work, you can definitely setup a home solar power system. How much would a residential solar energy system cost? If you were to engage the service of a profession solar contractor, the investment can be quite high. A complete solar system capable of supply free energy for your home can cost upwards of $30,000 – $45,000. The Return On Investment (ROI) can take as long as 10 – 15 years! It is fair to say not a lot of home owners can afford this option. If you are planning to setup the solar system from scratch on your own, the investment cost is definitely lower. A medium size system capable of generating free electricity for your home would cost around $1000 – $1500. The PV panels will be the heart of the system. Solar panels are used to harness the sun’s energy and convert it into electric current. This is possible due to a special semi conductive material known as Photovoltaic cells. The electrons in the PV cells will become excited when exposed to solar energy. The potential energy in the electron are used to create an electric current. The function of the charge controller is to take the electric current from the solar panels and use it to charge a battery bank. The charge controller will also regulate the amount of current going into the battery hence protecting it from overcharging. The volt and amp meter are measuring devices used to check the state of your home solar power system. The meters will tell you how much voltage and current flow are created by the solar array. This will be the battery bank used to store the energy generated by the solar panels. The kind of battery most suitable for a residential solar system is the deep cycle type. Deep cycle batteries are commonly used on boats and electric golf carts. They are more durable and can be discharged to a very low stage without damaging itself. The battery also releases its stored power slowly making it most suitable for home use. Since the energy stored in the battery is Direct Current (DC), you will need a device to change the DC to Alternate Current (AC). Most of the electrical devices at home will be running on AC. The function of the power inverter is to change the DC to AC. The final stage is to connect a power extension cable from the inverter throughout your house. Generally, the components above are what you’ll need to make a DIY solar system from scratch. All these components are available from major hardware stores nationwide. If you are working on a shoestring budget, you can actually save some money by making the solar panels on your own. What you have to do is source for used solar cells and solder them together in a solar box. This will save you an additional $150 – $200. To make your own DIY solar panel, what you’ll need is a good step by step instructional blueprint. 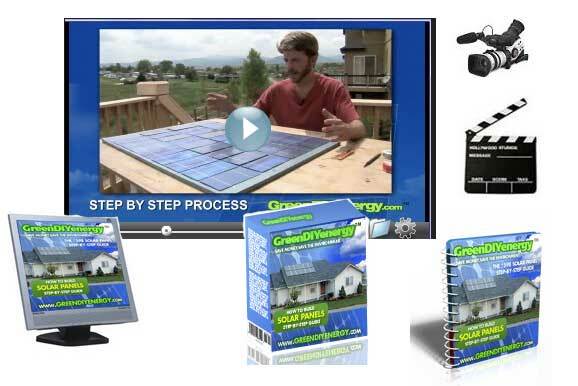 One of the best solar panel blueprints that I know of is the GreenDIYEnergy guide. The guide comes with plans in PDF file and step by step High Definition (HD) instructional videos. For more information, check out the GreenDIYEnergy review on this blog. If you have the proper plans you can build a solar panel and a wind turbine for less than it would cost you to buy a single solar panel and by doing this you can eliminate the power bill completely. Thanks.